Better statistics, faster | Brainder. This entry was posted in FSL, Statistics and tagged fsl, matlab, octave, PALM, permutation test, statistics by A. M. Winkler. Bookmark the permalink. Silly question: how many MC is a full permutation? you can run simulations to evaluate the minimum needed to have ‘stable results’. 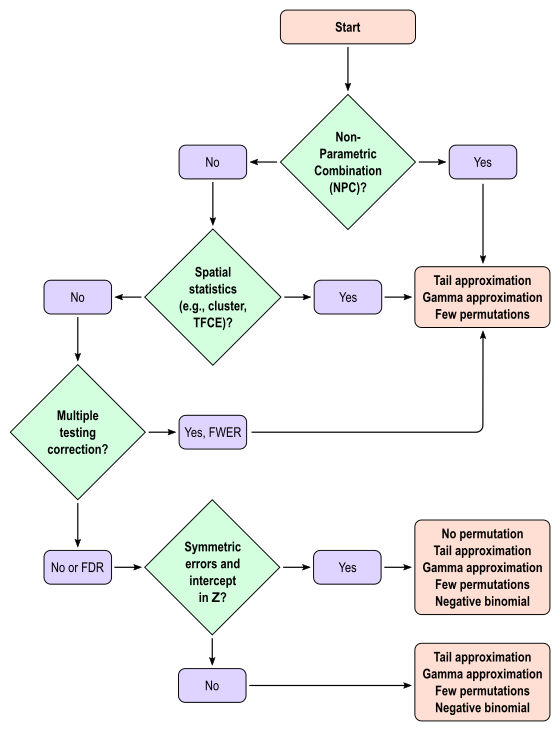 We have done that for eeg with Tom, and found cluster inference (mass or tfce) needs at least 800 iterations (http://www.sciencedirect.com/science/article/pii/S0165027014002878). So we do 1000 as default, no need to do more. The same could be estimated for MRI and fMRI (as I suspect is is data type dependent) . I think the suspicion that it’d be data type dependent is a strong one. We can compute the confidence interval and the resampling risk is also an evidence, although the latter depends on the strength of the signal, and that is dataset dependent. In the paper the “full” is the set of 50k permutations. 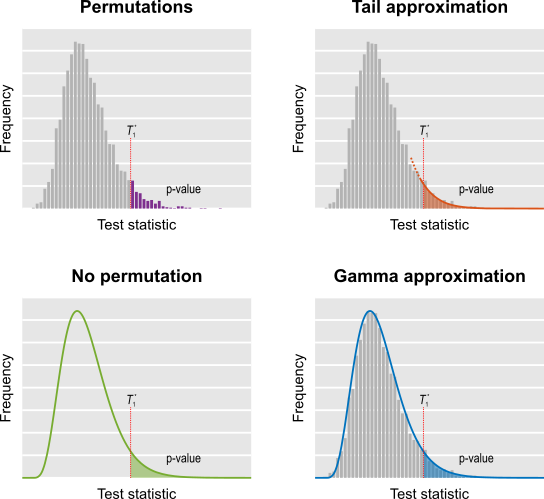 Some methods allowed undistinguishable results with 500 permutations only. I have attempted to run PALM on cluster. At first, to load on cluster, I used qsub with a command, which had been working well when running from the local disk. I modified the “palm” script to change IS_CLUSTER=1 and provided an address for the “tmp” file. The job was run, but there was no feedback from the system and what is more important, no output was generated. To troubleshoot, I ran palm without qsub and found it was throwing an exception, specifically it was something to the extent of “MATLAB is unable to recognize | “, i.e., a “pipe” character. Among the suspects is the fact, that we’ve gotten an older 2014 version of MATLAB installed on our cluster as opposed to 2016 on my iMac locally. Could that be a compatibility issue? All arguments supplied are passed to MATLAB so that the pipe goes along with it. If you are using pipe, i.e., the symbol “|”, to grep some specific outputs that are printed in the screen, no worries: in most cluster environments all outputs are automatically stored in a log-file, which can be perused later. If there is some other reason to use “|”, please let me know and perhaps there may be some other solution. Having said that, PALM currently doesn’t truly benefit from a cluster: it runs as a single thread without any parallelisation. It may still be useful to run in a cluster environment if you have powerful nodes that have access to the data and can be left running over many days (sometimes none of this is possible in a simple desktop or laptop). Even so, it will use just one machine. I want to use PALM software for the statistical test of 2D data which has Ns (number of subjects) x Nm (number of measurement sites) dimensions. I am trying to find which measurement sites are significant. Some of the elements of the matrix are missing. I see that PALM can handle missing data in the advanced options. However when I use the -imiss option by giving a csv file indicating the missing points in the data as 1s and the rest 0s, I receive an error. Should I use the -dmiss option together with -imiss ? However, I want to use the same design matrix for all Nm ‘s and only some measurement sites do not have data from let’s say 2 subjects. I attached my design matrix as an example.